WA12 did not attempt to quantify this effect, either for Alaska or for the Arctic in general. 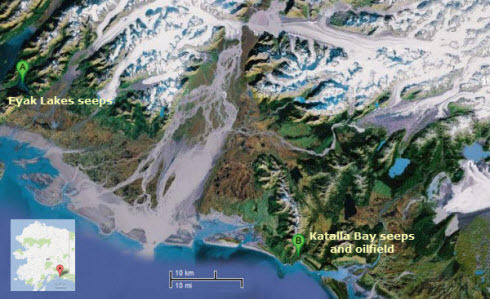 In my opinion, while it is a plausible contributory mechanism for the particular seeps they observed in Southern Alaska, there are probably not that many other areas in the Arctic where rapidly retreating glaciers are within a few kilometres of actively methane-seeping sedimentary basins. 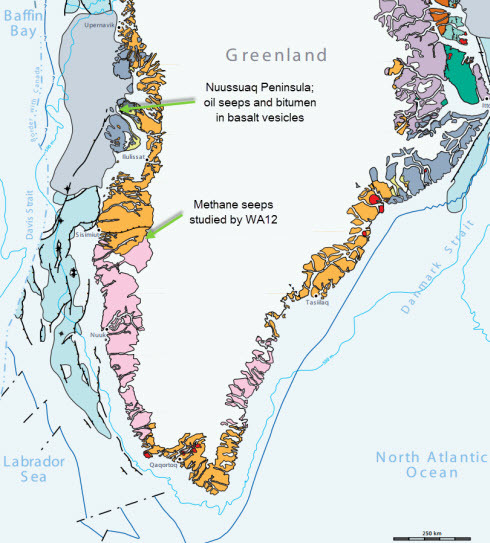 For example, as shown in a map of the sedimentary basins of Greenland in Figure 2, the western and south-eastern flanks of the Greenland ice sheet are underlain by Precambrian rocks that are unlikely to contain methane. There are some hydrocarbon-generating sedimentary basins, including an oil seep, on the western tip of the Nuussuaq Peninsula in West Greenland, but this is approximately 100 km west of the edge of the Greenland ice sheet, too far away to be influenced by elastic deformation of the crust due to retreating ice. In today’s interglacial period, there are two ice sheets remaining, in Greenland and Antarctica. Emerging research is pointing to the possibility that significant amounts of methane could be trapped under these masses of ice. Clearly, this is another area where the latest research is revealing that there may be new sources of carbon-cycle feedback lurking in the ground under the disintegrating cryosphere. Researchers are starting to understand the potential and the timing of these feedbacks better, but uncertainties abound and most scientists are naturally reticent when it comes to predicting how and when methane releases from these locations may occur. In the next and final part of this series, I’ll offer my personal perspective on this. This entry was posted in Hard Science and tagged Alaska, Antarctica, Greenland, Hydrates, Ice Sheets, Methane. Bookmark the permalink.